The online gaming industry is growing at an exponential rate, creating new opportunities and innovative revenue streams for gamers. The impact is being felt in the metro. KANSAS CITY, Mo. — The online gaming industry is growing at an exponential rate, creating new opportunities and innovative revenue streams for gamers. The impact is being felt in the metro. "I love making people laugh, entertaining people," said Anthony Kongphan. "I think that's what I really love about it and also gaming. I've been gaming my whole life." Kongphan lives in Overland Park. 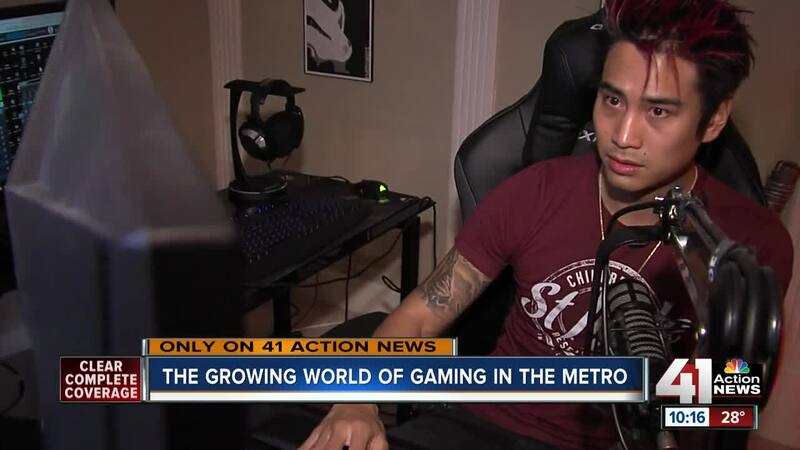 He's a streamer—he plays video games while live streaming and speaking to those who watch and comment. At first, it started out as a hobby but Kongphan has turned streaming into a full-time job. He also uses his video game fame for good. For example, he most recently raised $100,000 for St. Jude Children's Research Hospital. "It shows passion for people who care for one another and supporting what I do," he said. Like streaming, competitive video gaming is also booming. Park University is currently constructing a state-of-the-art gaming area, “Parkade," in the University’s Mabee Learning Center/Academic Underground. The university will become the first in the metro to offer a varsity esports program starting in Spring 2019. "We've been hosting intramural competitions throughout the time we have been here, for the past four months. Every competition that we have, people see the game up on the big screen or they have laptops open and are really interested in what is going on," said Benjamin Zibers, the director of student engagement at Park University. Parkade will serve as the home for the varsity esports program for matches and practices, as well as provide a central location for students to watch and participate in gaming-related activities. Esport athletes will be eligible for scholarships. The university is currently looking for a head coach.